To challenge the gods is to invite their wrath. So it is written of Lachyla, the Blighted City, in the Codex of the Ages. But who reads codices? And who really believes the tall stories of the Taleweavers? Dagra does. If it’s a story about the gods – even a dead god – he believes every word. When his sellsword team is offered a contract to cross the Deadlands and find a burial jewel in the crypts of the Blighted City, Dagra wants no part of it. His companions are undaunted by the legend; to them, the blurred divide between the living and the dead is superstitious nonsense. Completing the contract would earn their guild’s failing reputation a much-needed boost and secure them the bounty of a lifetime. They’re going, with or without him. Torn between the convictions of his beliefs and the importance of his friendships, Dagra reluctantly journeys into the godless region in search of the fabled city. But the Deadlands are only the first challenge. The sellswords uncover an age-old deception when they learn that Lachyla’s foul seed is much darker than its legend, that its truth must forever remain untold or risk plunging humanity into an eternal nightmare. Snagged on the barbs of the blight, Dagra faces the toughest choice of his life … and of his death. 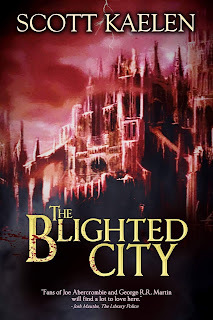 The Blighted City checks a lot of boxes for me. The action scenes are vivid and fast-paced. The characters are varied and detailed, the settings rich and immersive. There's a real sense of foreboding from the outset of the story, and the author delivers on giving the reader a horrifying adventure. The plot takes awhile to get going, though not to the detriment of the reading experience. If the pace seems slow to you in the beginning, my advice is to keep reading. We follow three groups: 1) three hired swords from the Freeblades guild who are on a mission to the Blighted City to retrieve a family heirloom, 2) hunters from a nearby village who track them, intent on keeping the secrets of their land from outsiders, and 3) a small group of more Freeblades who become concerned about their fellow guild members and go out to search and rescue them. There's a lot going on within the dynamics of each group, and all find complications in their plans. Though everyone sets out with the best of intentions, they quickly face unexpected circumstances and tough decisions. It's a lot to keep track of, but is a solid story overall. Just when I started finding inconsistencies in what caused the blight, the author revealed the full explanation for its source and answered all my questions. The one issue I struggled with was the point of view treatment. The story changes POV often, switching between all three hired swords, and multiple other characters from the many allies and enemies involved. It can be disorienting at times, and disrupted my immersion a bit. 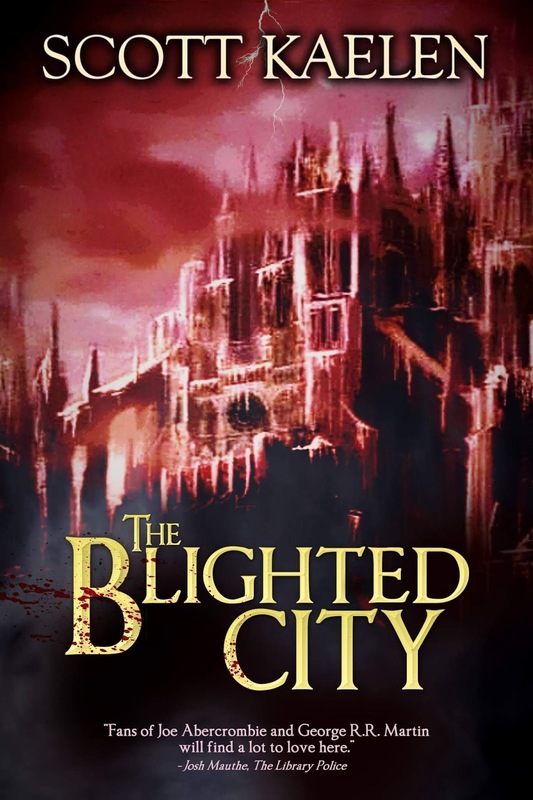 All in all, The Blighted City is a dark epic adventure in a well-detailed world full of swordfights, crypts, curses, and treasure. I recommend it to readers who enjoy multiple POV, conflicts that build gradually, and fantasy that delves into philosophical musings.